The Myth of Perfection: Redefining Success. I’ve been having lots of conversations recently about what constitutes life success. Within some circles, not finding a husband and raising a family is failing. In others, home-making and not pursuing a lucrative career is failing. Success can be defined by finances, relationships, good achieved, or acquiring a desired image. Each individual has their own definition, which is a great thing, but can also cause judgments of those who don’t share your definition and also an internal struggle when the things going well in your life are not the things that, in your mind, constitute success. The concept itself is massively relative, but universally important. Personally, I think I’m a little odd. I’ve never been one with concrete life goals. I never dreamed of the details of my wedding day, thought through the number of kids I want to have, pictured the house or location of my dreams, fantasized about “things” I wanted to acquire, or even dreamed of places to visit. Even with finances, my goal is to be comfortable enough with my financial status to allow me to not be worried about paying bills and to be regularly and unconcernedly generous. I don’t need fancy things, just things that function well. And I LOVE saving. Even in my dreams, when I dream about winning large amounts of money, Dream-Laura first gets excited about the amount of money she can then put away in retirement and savings (which is usually 95% of whatever the amount is… like I said… I LOVE saving). I think my lack of detailed life goals is a combination of the moment I decided to make a conscious effort to limit the amount of “expectation” I place of my life and my natural tendency to be a present-focused person (both topics of entire blog posts in themselves). I take what is given to me and work hard with what I have at that moment in time, while being logically aware that my choices will have positive or negative consequences on the future. I am highly aware that there are very few factors in my life that I have control over, and my tendency is to fight tooth and nail to maintain control in the areas I can and to limit the variables in the others. Take my career: all I can really control is my ability to do my job well and to be proactive about putting myself out there. I can’t make someone like my singing. I can’t make someone hire me over another singer. I can’t pick and choose the houses I sing at. I can’t even fully decide the roles I will get hired for. All I can do, is work with the voice I have, to understand how it functions, and to set myself free to make vocal and dramatic choices that express the character I am playing genuinely. And while I have places I would love to sing and roles I would love to perform, they aren’t the measure of my success. rying to manipulate your arm into the perfect position during the motion. It simply doesn’t work. The ball won’t fly as far when you can’t let go and let the motion take over. A while ago, after a couple of less-than-perfect performances and dealing with the feeling of failure, I talked with one of my trusted coaches about my need to redefine failure, to which he replied, “No, you need to redefine success”. If I take myself away from my own performance, I know that what touches me and excites me as a listener is not strict, mechanic vocal perfection. That may be great for about 5 minutes, but then that, on its own, gets boring. I LOVE voices with heart, risk, and a little blood in the sound. It’s a balancing act. You can’t give those characteristics to your singing unless you have command over the instrument. That’s where the life in the practice room and the life on the stage start to define their roles. 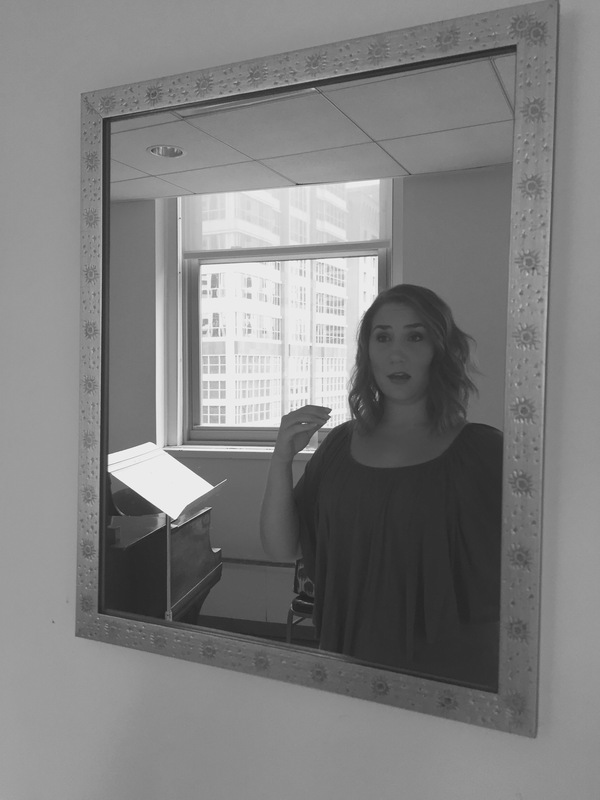 The practice room is to explore, solidify, repeat, stretch, and understand your singing. I’ve made the decision to not “make” my voice, but to discover it. The practice room is where most of that happens. But performance is where risk and reward comes in. I recently spent 2 1/2 weeks rehearsing The Merry Widow, in the place of the great Renée Fleming. She arrived last week to finish the rehearsal process and do the performances. But each day of rehearsal was like a little performance for me. I was able to play off of my amazing colleagues, make choices, take vocal and dramatic risks, and I found my voice being set free. Once you are a character, singing becomes a means to an end. The singing is there to express what the character wants to say or is feeling. When you are just practicing, it is a mechanism to be controlled. Success is the two combined. When you understand your instrument and how it wants to function, it gives you the vocal and musical vocabulary to express the extreme emotions in opera. I’ve decided, for me, performance success is letting my voice express genuinely. Will every note be perfect? No. (BLARGH…. It took me about 5 minutes before being able to type “no”…. I still HATE the idea of lack of perfection, even though I also recognize it is the reality of singing and… well… life). But I am on the journey to accepting that success can’t and shouldn’t be linked exclusively to the concept of perfection. AND perfection is also a relative term, at least in the area of aesthetics and the arts. As I look forward to moving away from my young artist days of mostly understudying and finally enter the world of performing entire roles on a regular basis, I find myself excited to have these rehearsal periods of discovery and the terrifying and wonderful risk of taking the stage and offering the audience all that I have to give. I will continue on the journey to redefine success with each new role and stage of life. I will keep the conversation open with my colleagues and those with more experience to share their wisdom in this area. If anyone has thoughts to share on this subject, I would love to hear them. How do you define “success”? Has it changed over the years? How do you performers gage your performances? Do you even think in terms of success or failure? As I walk down this path of discovery, I will also continue to strive to, in the words of Elsa, “Let it Go“. Fabulous Friday: When He Sees Me…. For my Fabulous Friday post this week, I want to share the song that proved to me that Sara Barielles, apparently, either has my brain or has a special view into it. This song, especially the first section, IS my relationship with “feelings”. I minimize the guessing game. I don’t like guessing games. Before I know the feelings. If I’m just tossed around by fate? Yep. That’s me. Feelings must make sense, I must be able to identify them, and I must be able to turn them on and off. While sometimes I think this makes me an emotional robot, I also think it makes me highly rational and… of course… I like that. 🙂 Enjoy!